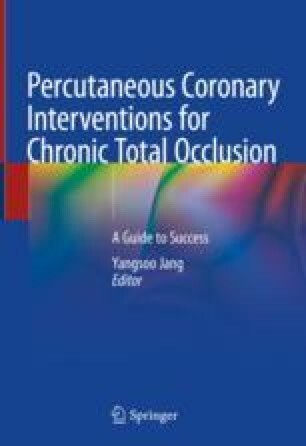 Diagnostic coronary angiography of chronic total occlusion (CTO) lesions plays an important role in establishing the initial treatment strategy by assessing the indications of interventional treatment and the potential problems which might arise during the procedure. However, coronary angiography for the evaluation of CTO lesions should be in some respects different from usual lesions. Although recent advances in computed tomography (CT) have proven to be helpful in many cases before and after the procedure, we have to deal with guide wire during the procedure by the information obtained from coronary angiography. In addition, even with the same coronary angiography image, there is much difference in the information that an operator can obtain according to the operator’s expertise.